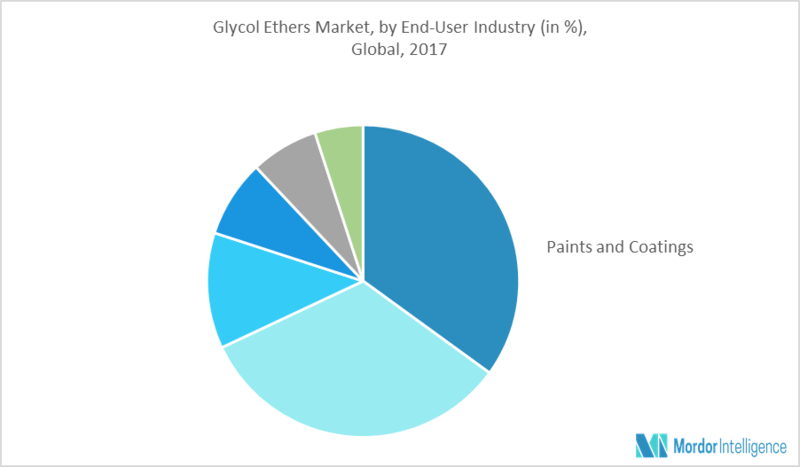 The market for glycol ethers is expected to register a significant growth during the forecast period, 2018 to 2023.This tremendous growth is significantly driven by the increasing use in cosmetics and personal care products. Glycol ethers, such as PEG-25 propylene glycol stearate, PEG-75 propylene glycol stearate, PEG-120 propylene glycol stearate, and PEG-55 propylene glycol oleate help various ingredients dissolve in a solvent, and hence are used in various cosmetic formulations. According to a report by L'Oreal, the global cosmetics industry was estimated to be around EUR 205 billion in 2016, growing at a rate of more than 4% through the years. The personal care industry too is rising rapidly through the years owing to growing awareness among consumers about health hygiene. The growth in this market is primarily driven by countries, such as South Korea, India, United States, Brazil, UAE, and South Africa. Such positive growth is expected to drive the cosmetics and personal care industry, which, in turn, anticipated to drive the market for glycol ether through the forecast period. Paints & coatings industry is one of the major end-users of glycol ether. These are widely used in the formulation of architectural and automotive coatings. With growing consumer spending and rising population, the global automotive production has been increasing constantly. According to ACEA (European Automobile Manufacturers Association), the global production of motor vehicles was somewhere around 96 million units in 2016. These factors, in turn, are likely to have a positive impact on the glycol ether market for automotive coatings. Additionally, the growing global residential sector consistently with the recovering construction industry in Europe and increasing investments by the Indian and Chinese governments on their respective infrastructure sectors is expected to propel the demand for glycol ether in the formulation of architectural coatings. Asia-Pacific represents the largest regional market of the global glycol ethers market with almost 40% of the market share. The accelerating demand for eco-friendly coatings and the increasing demand from the automotive sector are the major drivers for the Asia-Pacific glycol ethers market. Even the cosmetics industry in Asia-Pacific, which is largest regional market of the cosmetics industry is further instrumental in strengthening the position of the region in global glycol ethers market. January 2018: China launched an anti-dumping review of industrial solvents ethylene glycol monobutyl ether and diethylene glycol monobutyl ether imported from the United States and the European Union. July 2017: Sadara started production of propylene glycol in Saudi Arabia. March 2017: Seven ethylene glycol ethers have been declared not harmful as defined by section 64 of the Canadian Environmental Protection Act, 1999 (CEPA) in a draft screening assessment. Major Players: BASF SE, Eastman Chemicals Company, Royal Dutch Shell, DowDuPont and Sasol Limited among others.